Smokey eye shadow looks are a common love among most girls. Celebrities like Kim Kardashian, Beyonce and Kristen Stewart have been seen sporting different forms of smokey eye makeup looks. This look works great no matter what you complexion is. Here is a fun purple smokey eye shadow tutorial with a pop of bronze. Make sure to team this look up with a winged liner look, since they look great together.Â This makeup look can be great for any evening event and will match almostÂ any cocktail dress you choose. So letâ€™s go straight into how to create this smokey purple and bronze eye shadow look! On clean eye lids, applyÂ eye shadowÂ primer and blend for a flawless makeup application. Applying primer prior to shadow ensures your look lasts all day and prevents the eye shadow from creasing. Apply Bronze eye shadow on the whole of the lid without creating any extensions. Apply very evenly on to the whole of the rim. Apply the purple eye shadow on just the crease. Make an enclosed jacket with the purple eye shadow. Now take the charcoal or black eye shadow and apply on the exterior of the lid to create a Smokey effect. This will give this shadow look an exotic touch. Now use the silver highlighter on the whole of the brow bones. Also apply on to the eye and nose joint. The shadowing part is done. Time to move onto the liner. Make a tailed liner extension on to the upper lid only. Do not make it not too thick but as a thin and sleek line running from near the nose joint to the exterior in a winged form. Use a black liner pencil or a kajal on the lower rim. Join the lines at the eye ends but do not extend in a winged form. This will give a completely different kind of a look to this eye makeup other than the usual form of winged extensions. Use mascara in a top-down way on the upper lashes and in a zig zag way onto the lower lashes. Comb the lashes with a lash comb to avoid getting any clumps of mascara. Follow up with another coat of Â mascara if you’d like. 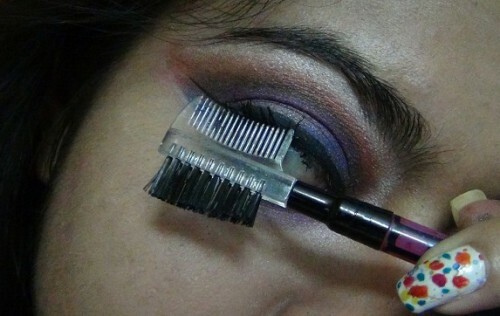 Step 10:Use a lash curler to add that extra curl effect on your lashes. Step 11: Here is a close up of the final look on this amazing bronzed purple smokey eye shadow look. Perfect for a date or night out with the girls! Chetana is an amateur makeup artist from India and founder of StyleCraze – India’s largest beauty network. She is completely addicted to makeup, especially the colour play and the process involved. Visit StyleCraze for more smokey eye looks and other makeup tutorials!